Clonliffe stewards for Sunday`s Night run in Dublin city meet at Ringsend Library at 8.00/8.15pm. If you haven’t confirmed yet but are available please text Joe Cooper 0872256004. A: Efrem Gidey, Cathal Doyle, Ian Guiden, Colm Rooney. The women`s race is 1 mile, 2 mile, 1 mile with a youthful Clonliffe team of Hannah Browne, Alannah Cooley and Ale Hernandez. There is also a Masters mens team, M/50 of Declan Grant, Kevin Dowling and Sean Grimes. As the field was sent on its way at 8 PM sharp it was pleasing to see so many Clonliffe vests at the front end of the field as the athlete exited the stadium heading towards Northwood. Coscoran led from Clonliffe pairing Colm Rooney and Efrem Gidey as the race exited the stadium. At the Crowne Plaza crossing into Santry Demesne Croscoran held the lead with Rooney just on his tail and Efrem cut slightly adrift. As the leaders hit the track they were separated by a tiny margin but Coscoran’s superior track speed paid dividends as he came home opening the gap on Rooney with 200 to go to win the Historic Clonliffe 2, Coscoran breasting the tape in a time of 9.13, the 2nd fastest on the new Santry course with Colm Rooney 2 seconds adrift (9.15). Efrem held onto third place (9.28) with Sean Doran coming in fourth place (9.50) chased in by the fast finishing Clonliffe junior pairing of Aaron Cullen and Ben Guiden finishing two abreast in 5th and 6th with identical times of 9.51. The women’s race was won for the second successive year by Nadia Power (Templeogue), 10.46 in second place from Donore Harriers was Ide Ni Dhomhaill (10.53) and Bronagh Kearns (St Sennans) third (11.18). The top six women completed by: 4th Laura McDonnell (Tallaght) 11.19, 5th Holly Brennan (Cillies AC) 11.29 and 6th Maura Kearns (Donore Harriers) 11.42. In the junior race with Efrem, Aaron and Ben taking senior prizes the top three was another Clonliffe trio of Thomas Baltazar (10.32), Evan Foster (10.35) and Ian McElweney (10.42) whilst the top three junior women, again all Clonliffe, were Aoife Hession (12.24) , Sarah Bateson, after a bad fall on the start line, (12.29)and Orla O’Sullivan (12.53). In the Masters categories firstly master men: M/35 David Brady (Clonliffe), M/40 Shane Casey (Clonliffe), M/45 Shane Larkin (Drogheda and District), M/50 Seanie Meyler (Omagh), M/55 Maurice McCrohan (Clonliffe), M/60 Desie Shorten (Parnell AC), M/65 Mike Mac Domhanill (West Limerick) and M/70 Matt Cooley. In the master women W/35 Ailish Malone (Clonliffe), W/40 Laura Kiernan (Clonliffe), W/45 Deirdre Fitzsimons (Clonliffe), W/50 Aine McCann (Clonliffe) and W/55 Mary Waters (Navan AC). NOTE: Uncollected prizes for Sean Doran, David Brady, Maurice McCrohan are behind the Bar! The action comes thick and heavy now! Tonight sees the Clonliffe 2 in Santry and on Saturday the 27th, it`s the 2nd round of the Dublin Juvenile track & Field League, also in Santry. 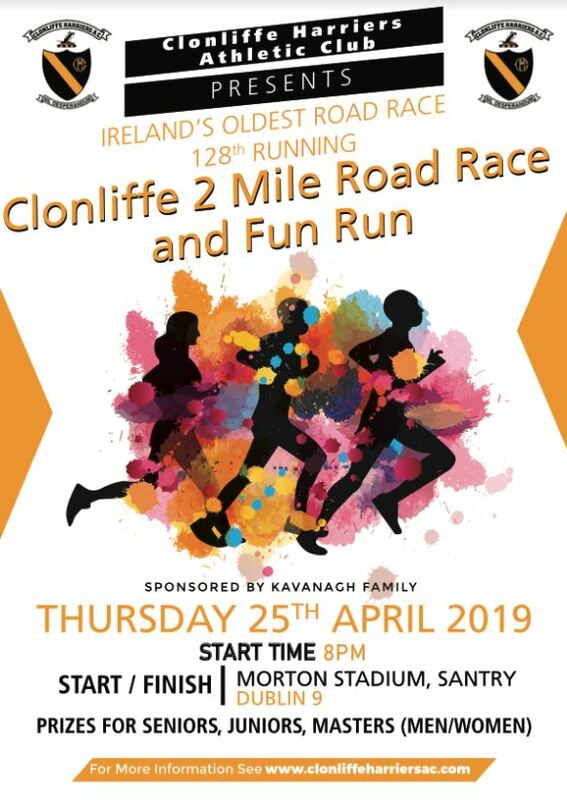 Thursday April 25th 2019 @ 8.00pm sees the 128th running of the Clonliffe 2, Ireland`s Oldest Road race. The historic race will take place in Santry starting on the track in the Morton Stadium. The Clonliffe 2 Mile is the oldest continuous Road Race in Ireland and one of the oldest in the world. The race commenced in 1891 as a club race, soon to become an Invitational 2 Mile and eventually an Open Road Race. This is the 128th consecutive running. The event now caters for fun runners, club and elite athletes. The race will be sponsored this year by the Kavanagh family in Glasnevin. The late Eugene Kavanagh commenced sponsoring this race back in the mid 1980s. Clonliffe Harriers are very grateful to the Kavanagh family for their continuing sponsorship of this event. Prize giving and refreshments will be place in the Clonliffe Club House after the race. Full results will be online asap that night. Race check in and changing facilities are located in the Clonliffe clubhouse, in Morton Stadium Santry Dublin 9. Number collection – Those who have entered online will be able to collect their numbers at the Clonliffe clubhouse from 6.15pm. Registrations will be taken on the night of the race from 6.15 – 7.30.pm. Limited parking in the stadium. Do not park on the Avenue in the stadium. Do not obstruct local neighbour’s access to their homes please. The race will be held on open roads. The Gardai will be in attendance, however, please be careful and watch for traffic. Please obey the on course marshals. No head sets allowed. St. Johns Ambulance will be in attendance to deal with any medical issues. Thank you for participating in Ireland`s oldest road race. Please enjoy the race. The star of the Easter weekend was Brian Flanagan who ran a superb new 3000 SC pb in LSU for McNeese University in the States on Saturday, the 20th of 9.09.16 to take a fine win. This run propels Brian well into the Clonliffe top 10, as he hits 8th on the list and also moved him up into 3rd place in the Southland Conference. From the McNeese web site: “I was very pleaded to get a great run in today,” said Flanagan. “It was a huge boost for me mentally after struggling all fall, even missing the cross-country season due to injury. I was taught by an old Irish coach that distance running is 49% what you have in your legs and 51% what’s in your head. This spring, I knew I’d built up the adequate fitness to match and even beat rivals. But with this new PR today, it has given me the confidence in myself that my best days are most definitely still in front of me going into the conference meet in two weeks. It’s a great day to be a Cowboy!” Wonder who the Old Irish Coach is!! Also in the US over the weekend Steve Flanagan ran his track 10000 debute a solid 32.35.07. At the Streets of Naas 5k on Easter Sunday, Sean Doran lead home the field to take a great win (16.13). On Good Friday the Curran girls, travelled to Leitrim where Mel was 45th in the half marathon in 1.56.48 while daughter Cara went one better, 44th in the 10k (54.40). Easter Monday and at the Clontarf 10 mile: 4th Sean Doran 55.36. Others Alan Worrall 66.40, Philip O’Doherty 67.30, Stephen Bateson 69.29, Noel O’Dwyer 71.24, Trevor Wisdom 71.41, Anne Lyons 80.19, Aine MCCann 80 27. Coaches and athletes are kindly requested to adjust their training schedules for next Thursday the 25th. With the Clonliffe 2 taking place these athletes must be allowed priority. All are asked to suspend training for the race duration as the race starts and finishes on the track. If you were kind enough to hold off between 7.50pm and 8.30pm it would be really appreciated. Please be aware that this being an open race many participating will be unaware of track ethicate so shouting “track” or otherwise will not work. Best therefore to be cautious. Juvenile training for Gladys group on Thursday is cancelled to facilitate the race. The committee thanks all for their co-operation. Clonliffe Harriers extend our condolences to our club coach Ben Lawler and his family on the passing of his father John early this morning. Arrangements: Reposing at home in Ballymun on Tuesday from 5pm to 8pm. Removal on Wednesday morning to the Church of the Holy Spirit, Sillogue Road, Ballymun for 10.00am mass, followed by burial in Dardistown. 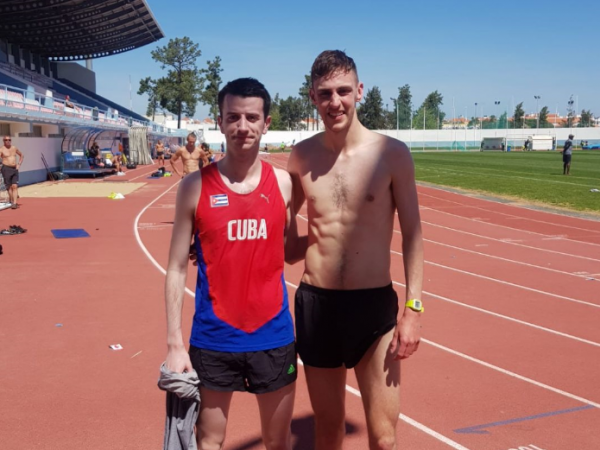 As we recover from the weekend`s cold and rain news just in from Monte Gordo, Portugalof 20 plus degrees where Ian Guiden and Cathal Doyle are putting in excellent sessions gearing up for the track season. Also travelling to Portugal in recent days, Lisbon for a warm weather training camp are the sprinters under John Shields. It`s a hard station! The count down is on. Only 10 days now to the Clonliffe 2. On Thursday April 25th for the 128th time the Historic Clonliffe 2, Ireland’s oldest continuous road race and one of the oldest in the world takes place. Clonliffe Harriers invites Club and Fun runners to participate in this year’s Clonliffe 2 Mile taking place in Morton Stadium Santry on Thursday 25th April 2019 at 8pm. The 2 Mile starts and finishes in the famous Morton Stadium in Santry, Dublin 9. The race also incorporates a lap of the beautiful Santry Demesne. The Clonliffe 2 Mile is the oldest continuous Road Race in Ireland and one of the oldest in the world. The race commenced in 1891 as a club race, soon to become an Invitational 2 Mile and eventually an Open Road Race. This is the 128th consecutive running. The event now caters for fun runners, club and elite athletes. Prize giving and refreshments will be place in the Clonliffe Club House after the race. A special commemorative tee shirt will be given to the first 150 entrants. Limited parking in available in Morton Stadium. The following Dublin Bus routes can be used to get to the Stadium. No 16, 17A, 27B, 33, 41.